– Advanced GPS assisted: GPS mode enables precise positioning and prevents losing the drone. The drone will perform an Auto-Return when the battery is low or if it loses signal. With this new function, you can have more fun and enjoy a safer flight. – Smart Return to Home (RTH): Press this button when the drone in GPS mode will cause the drone to fly back to the home point that you set as to take off. Find back your drone when you fly it out of sight. – Follow Me Mode: follow to the GPS in your smartphone, ensuring your drone captures you with high precision wherever you go. – Altitude hold, Headless Mode, One-Key Take-off / Landing, and Emergency Stop: These features are perfect for beginners to fly the drone and reducing the learning curve. – Longer control distance: More than 300m remote control distance. Removable 3.7V 1000mAH, high-capacity rechargeable battery with energy-optimized system gives you a vastly improved flight experience. Up to 10 minutes of flight time! 🚀[1080P( SD Card Required) HD Wi-Fi Camera]: 120° FOV and 75° Adjustable angle, captures HQ video & aerial photos. The 1080P HD camera captures high-speed picture transmission without delay. It records all your memories while you enjoy them in real-time. 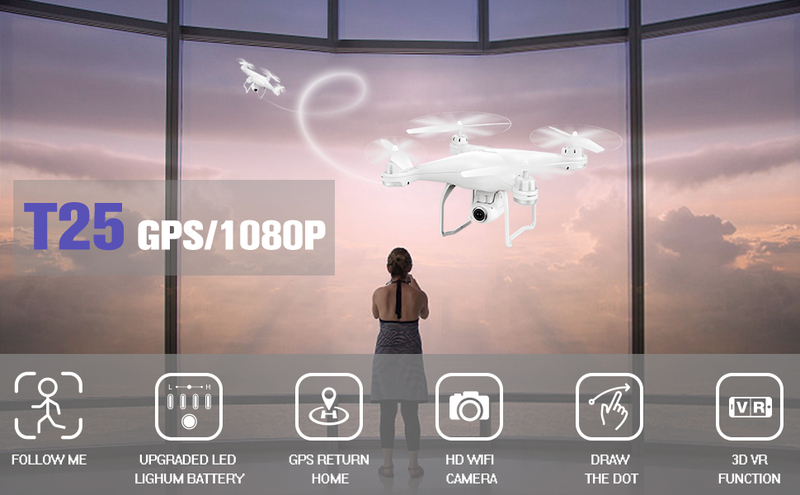 🚀[Dual GPS]: GPS + GLONASS positioning provides you with the accurate positioning details of your drone. It also features automatic, low power, & no signal return. 🚀[Follow Me Mode]: With your smartphone, you can direct the drone’s GPS, allowing it to automatically follow you while simultaneously capturing all the videos & photos you want. 🚀[Farther Control Distance]: Up to 300m, so you can experience a wider worldview and enjoy a more pleasant flight experience. 🚀[All-Round Function]: Headless mode, altitude hold, & one key takeoff/landing for easier operation. No need to worry about the orientation, with a simple press of a button your drone will ascend or descend, this is perfect for beginners.